ST. BONAVENTURE, N.Y. — Everything was set up the way Mark Schmidt could have wanted. His St. Bonaventure team controlled their own destiny, win and in, as they faced off against the lowly Fordham Rams. But this is not a movie and there is no script to follow except the one Bona made along the way. The Rams, losers of 14 of their last 15 games, came into the Reilly Center with nothing to play for except being a spoiler. And they turned in an Academy Award winning performance, defeating the Bonnies, 76-72 in front of 4,515 fans in attendance for Senior Day. Even with the loss, the Bonnies (14-15, 7-9) still had hope that they could sneak into the Atlantic 10 Tournament, albeit not in the way they envisioned. However, Schmidt and Bona’s hopes were dashed at 8:51 p.m. as the buzzer sounded in Charlotte, officially eliminating the Bonnies from the Atlantic 10 Conference Tournament. A complete and stunning turnaround from last season in which the Bonnies won four out of their last five games in the regular season before winning three straight to capture the program’s first A-10 Title. But that is a distant memory today as the facts are almost too hard to conceive. Not only did Bona get handed a cupcake by playing Fordham (7-24, 3-13), they hosted them on their home court on Senior Day, giving themselves more momentum. The hapless Rams had not won a road game since Dec. 10, 2011 against Monmouth and their first A-10 road win since Jan. 28, 2009 when they defeated the Bonnies. Damning words about a team that graduated four seniors, three of which starters, and all important pieces to last year’s title run. But it’s also been the story of a season filled with missed opportunities. 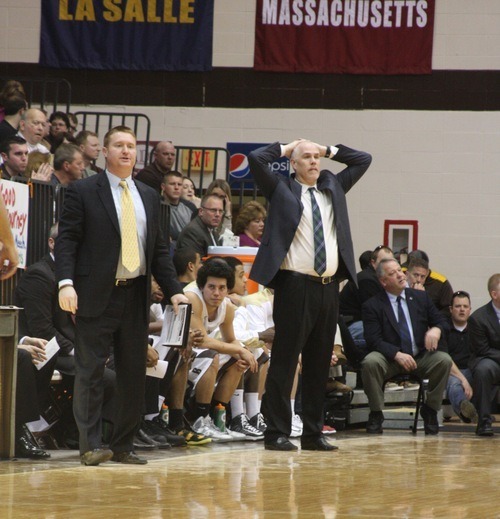 One shot here, one defensive stop there and the story could have been written different about this Bona squad. While many predicted this type of gloom for the Bonnies’ program following the departure of First-Round NBA Draft Pick Andrew Nicholson, it was not Nicholson whom Bona seemed to miss. Far too often this season, Bona was outplayed in the paint or dominated on the glass. Lack of not only height in the paint, but toughness spoke loudly. While Nicholson supplied much of the scoring last year, it was Da’Quan Cook who did the dirty work. It was Cook who would effectively shut-down another team’s big man. It was Cook who would sky for rebounds, both offensive and defensive, to keep Bona in the game. And it was Cook who refused to let the Bonnies be bullied in the paint. Except that’s what happened all season, including last night. Against Fordham, Bona was out-rebounded by a 35 to 24 margin, including an absurd 19 to 6 margin in the second half. The Bonnies were out-scored in the paint by a 42 to 28 gap and lost the second-chance point battle, 21-9. Two words that Bona fans have used a lot this season and used again last night. But take those two words and the season into perspective. St. Bonaventure’s Matthew Wright had a 3-point attempt at the end of regulation go off the side of the iron against Canisius. Chris Johnson had the same happen to him at Arkansas State. Demitrius Conger had it happen against La Salle. Just a few inches the other way in each game and Bona could be looking at their season a lot differently. The loss of Nicholson, supposed to hinder the offense, did not happen. 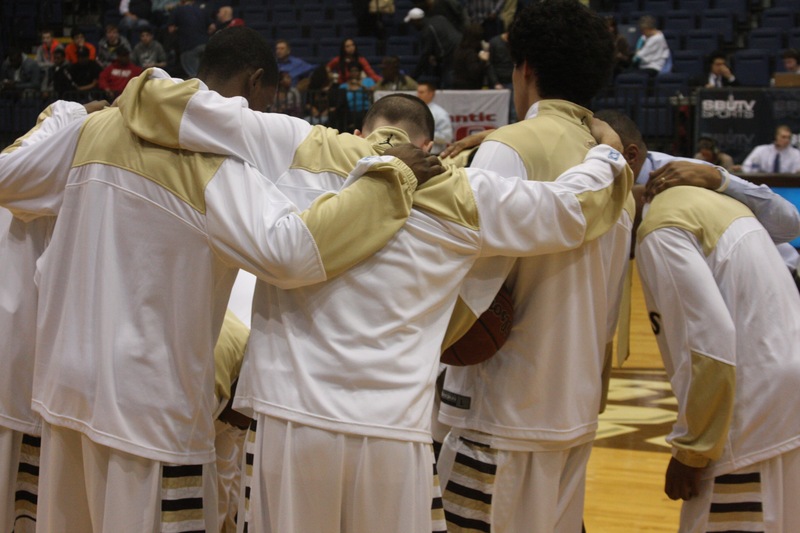 The Bonnies ranked fifth in the conference in scoring and second in 3-point field goal percentage. And while Bona graduated four seniors, there is still talent left on this roster, something many did not predict once Nicholson graduated. Ndoye’s development this season was a major story-line and he saved his best for last, scoring a career-high 17 points against Fordham. The Senegal native, already a menacing force for opposing guards driving the lane, has plenty of untapped potential. Jordan Gathers, a key player last season for his defense, saw his offensive production increase when he attempted his shot. Gather set a career-high against Richmond with 18 points, going a perfect 7-of-7 from the field, becoming the first Bona player in 16 years to attempt seven shots without missing. Even Dion Wright put together a career-high performance himself with 15 points on 5-of-7 shooting against Charlotte. The freshman always was active on both the offensive and defensive ends and once he grasps Schmidt’s playbook, he can be Conger-like in his production. While Bona’s season ends in disappointing fashion, one must look at where this program came from. Expectations are heightened and talent is abundant because of the impact seniors like Conger and Davenport had on the program. As one season ends, another begins, bringing with it more expectations and chance to continue build the Bonnies into a perennial contender, one shot, one defensive stop and one rebound at a time.